The palladium based reactors (calorimeters) have shown some disadvantages that are hard to ignore. The most alarming phenomenon is the local destruction of the palladium lattice by micro craters that are the result of a local melting (exploding) of the palladium lattice (see figure 16; the image can be find at page 69 of the DTRA report). The consequences of these local damages of the palladium lattice is the reduction of the lifetime of the lattice. In other words, the usefulness of LENR reactors that are based upon a metal lattice to lock the hydrogen atoms is restricted. Not because of the decrease of the heat production of the reactor, but especially because it shows that the reactor cannot be refilled with hydrogen or deuterium. The active area of the palladium based reactor is near the surface of the lattice so every damage is irreversible. The only way to reduce the forming of craters is to decrease the size of the “active spots” and to distribute them over the surface of the reactor. For example a mixture of palladium nano particles and particles of another non-oxidizing conductor. Low temperature fusion of hydrogen/deuterium isn’t possible without some type of electromagnetic stimulation. Free electrons represent high energy densities in relation to photon capture, so it is clear that the nuclear fusion must be stimulated with the help of an electric current. A shut down of the electric current stops the fusion and it is possible to manipulate the nuclear heat production with the duration of the on/off-state of the electric current. The image below (figure 17) shows a hypothetical LENR rector. It is a nickel staff that is plated/covered with the “fuel” mixture. The isolation has no other function than to protect the mixture from scratches, etc. The nickel staff conducts a high frequency alternating current to force the free electrons to the surface area between the staff and the conductive fuel mixture (skin-effect). The thin layer of fuel mixture has a low density of hydrogen/deuterium atoms in comparison to a beta-phase hydrogen adsorption by a palladium lattice. 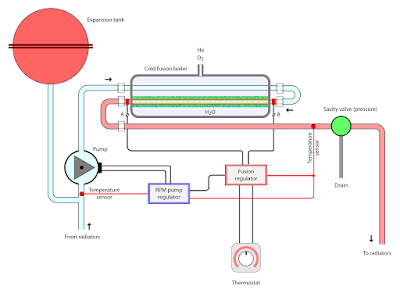 Without additional adaptations the hypothetical reactor will be running out of hydrogen/deuterium soon. The only reasonable modification is to adopt some kind of a hydrogen refill mechanism to keep the reactor running for a long time (not permanently but periodic, described above). 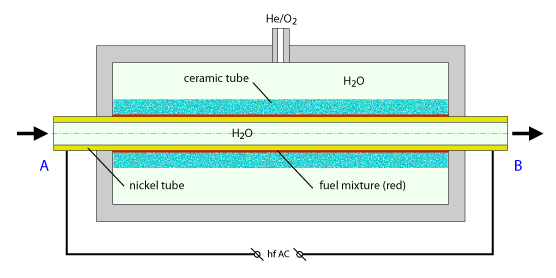 To resupply the hydrogen into the fuel mixture it is necessary to withdraw the isolation and replace it by an open structure, for example a ceramic tube. In the image above (figure 18) the hydrogen is replaced by water (heavy water) to avoid the danger of explosions. 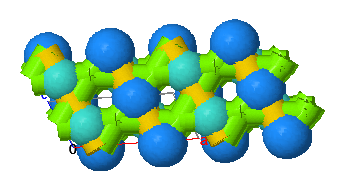 Now a metal lattice is useless so the lattice is replaced by zeolite powder to enclose and lock the water molecules. Heat from the nuclear fusion is transferred to the water that flows inside the nickel tube. The high frequency alternating current is responsible for the concentration of the free electrons at the surface of the nickel tube. These free electrons have to trigger the fusion of hydrogen atoms that are near the surface of the nickel staff (the fuel mixture cannot be an electrical isolator). The fusion of the hydrogen atoms of a water molecule will free the oxygen atom. Due to the reduction of atom volumes (2H > He) and the proportions of the caves and channels within the zeolite (see figure 19) the oxygen atoms and helium atoms can escape and “fresh” water molecules can be adsorbed by the zeolite powder when there is no heat production. However, only a small portion of all the types of zeolites can resist high temperatures (~1000 to 1200 degrees Celsius). So choosing the right type of zeolite will prevent the reactor from producing heat in an uncontrolled way. Because when we use a cold fusion reactor as a water heater the maximum temperature of the stored water is about 80 to 90 degrees Celsius (see figure 20). Now there is no need for a type of zeolite that can resist 1000 degrees Celsius or more. Therefore, an uncontrolled supply of heat will destroy the zeolite and the fusion process stops. So the reactor is save by itself. To resupply the hydrogen it is necessary that the “fresh” water is not contaminated by chemicals and dust. However, the heat from the ceramic tube will boil the water in the “fuel reservoir”. So it must be cooled by the cold water inlet (pre-heater). 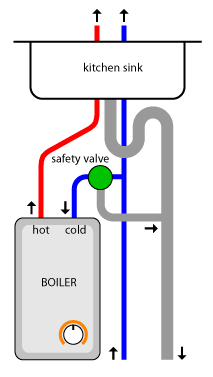 The image below shows a schematic of a central heating system for domestic use that is “powered” by a cold fusion reactor (figure 21). These small types of thermal applications are easy to construct when the fusion reactor is simple and the hot water output temperature is relative low (< 100 degrees Celsius). So it is sensible to focus first on the design of small and save cold fusion reactors. The fuel mixture itself is not restricted to the proposed mixture of zeolite powder, conductive powder and heavy water. Probably some Silicates are better suited to lock water molecules (smaller pores) and to resist the heat of the low energy radiation (Sodium Silicate melting point is 1088 degrees Celsius and SiO2 has a melting point of 1713 °C). However, any mixture can be applied when it is save and easy to use under normal conditions (temperature and pressure).